All energy comes from the sun. The sun has provided a lot of BTUs for a lot of years and the earth has absorbed and stored that energy. A closed-loop geothermal system simply removes those BTUs from the ground in the winter and gives them back in the summer. At depths of five feet or more, the earth temperature remains close to 57 degrees, as evidenced by a cave's temperature. This temperature varies only slightly across the US. There are 2 ways to install a geothermal unit. If digging a trench is difficult or if space is limited, geothermal contractors drill holes into the ground vertically to install small-diameter polyethylene pipe. If digging a horizontal trench is feasible, the pipe is installed in a horizontal trench. A very small pump then circulates water from the earth to the geothermal unit and back to the ground in the closed-loop pipe. As it circulates 57-degree water in the winter, the geothermal unit, using the compressor to remove heat from the water, provides 105-degree air into the house. As the water goes back to the ground loop, it immediately starts absorbing BTUs from the earth. In the summer, a reversing valve simply reverses the process and the compressor pumps BTUs into the ground loop. Geothermal gives good hot air in the winter and really cold air in the summer and uses less energy than any other central heating and cooling system. So don't be a tightwad. Buy the best there is - you, your family, and your house deserve it. 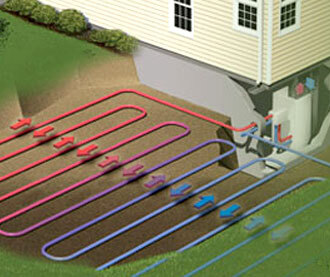 For more info on geothermal units and if they would work for you please contact Sandium Heating and Air Conditioning. Having geothermal unit at home has many advantages. This service and Petro Heat Canton service is both excellent service providers.